This blogpost is in partnership with Macy’s. All opinions and thoughts are my own. I love when Fall time rolls around… The leaves are changing and the temperatures are definitely cooling down. One of my go-to layering pieces has always been a leather jacket, and today I’m sharing two different ways to style a leather jacket this Fall! Leather jackets are a staple in both the male and female closet, giving a tough and edgy approach to your outfits. Not only are they stylish and luxurious, but they look amazing when worn with anything as they are extremely versatile. The best thing you can do for a Fall and Wintertime leather jacket is opt for a size bigger than what you would normally wear. I’m not talking about a really oversized and baggy leather jacket as that’s not going to be flattering, but just 1 or 2 sizes up from your normal fitted size as this will leave room for layering underneath. Once you’ve picked the perfect leather jacket as the basis for your look, leave it up to the accessories to finish off the outfit. I fell for the Sanctuary Ophelia Studded Leather Moto Jacket , complete with edgy stud embellishments and cropped to perfection at the waist! Business Basics: I love this business casual look put together with basics every girl should have in her closet — trousers or leggings in black and a white blouse. If you’ve been searching for the perfect leggings in velvet, I highly recommend the Sanctuary Grease Velvet Leggings , and how adorable is this Sanctuary Bianca Ruffle-Sleeve Top with graceful ruffle-detail sleeves? This outfit can be dressed up or down. I added a “girl-tie” and glitter boots to make my outfit more playful and fun. 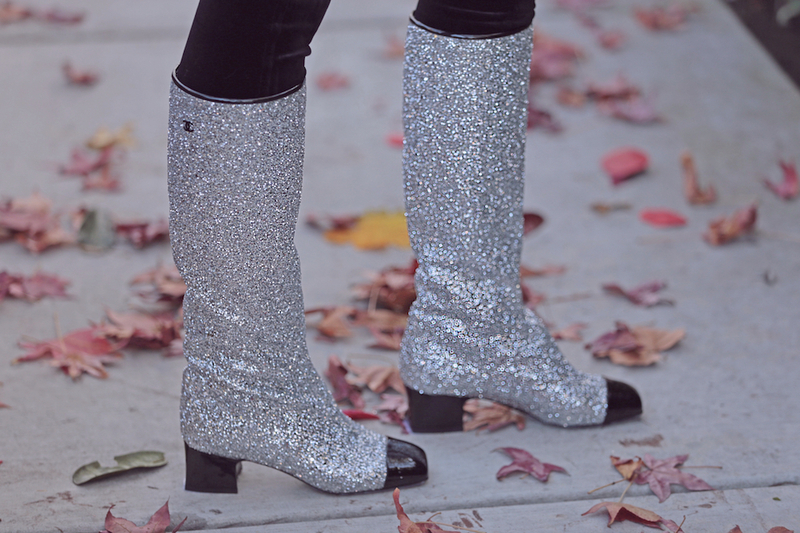 Glitter boots are by far Fall’2017’s biggest shoe trend, and such a fun element to add to your everyday casual look, or even as your work outfit if your job allows a little bit of sparkle. Relaxed Everyday Look: Pull off an easy, breezy look with an everyday dress, and accessorize with your favorite pumps or booties for a feminine and fun look! Throw on a leather jacket for a bit of edge. I’m wearing the Sanctuary Dakota Floral-Print Choker Dress with my leather jacket, and I skipped the tights to match with a pair of thigh high socks. If you’re not a fan of thigh high socks, add a pair of boots in stead. Add a scarf or earmuffs. Totally weather appropriate! Beautiful outfits, Charlotte! Love the tie and boots!